On Monday I made a post "Tournament Turnout" highlighting what I saw as declining numbers locally. Re-reading it yesterday I thought it was a bit disjointed and lacking in detail so I removed it. Here is a second take, this time backed up by some analysis. Below is a table looking at WHFB events in the Southern North Island over the past three years. 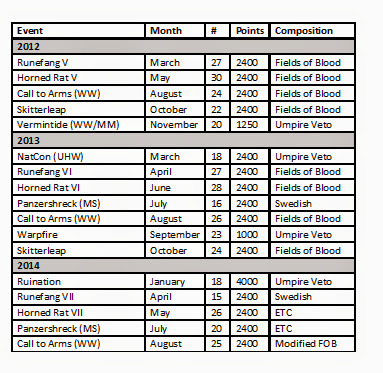 Included in the table is the event, month, number attended, points value and the comp system used. Generally 2014 has seen less people attend events. This is partly due to attendance at Ruination (expected) and Runefang VII. The rest are in line with previous years. The area has a limited player pool - population-based, to a certain extent - and that acts as prime determinant. However I think the numbers also show some other points. In 2012 the Fields of Blood events moved to a standard model - permissive comp, standardised (read default sports) and accommodative painting. Since then there have been two main changes. The first of these was the introduction in Comp system used. There were a vocal number of local gamers - and yes I remember who you were :-) - that said events were stale and that we needed to explore different comp systems. Now I appreciate that for regulars familiarity can breed contempt - and of course the grass is always greener. However I'd say in retrospect that that was an error. Firstly, while there are a number of attendees who like to pore over all types of comp system trying to build the ultimate list, there are at least and equal number of gamers who aren't interested in that level of complexity. Secondly, people like to bring their toys. They therefore want a permissive system. A basic tenet of comp is that "Everybody else's army is broken whereas yours is a model of innocence". People want to be able to bring what they want. The counter is to have a level of comp that allows that but knocks the worst excesses off "everybody else". Finally, a lot of people like certainty. GW armies aren't cheap. Nor is the time investment small. Not everyone wants to buy and paint 3000+ points of an army to accommodate the vagaries of different comp systems. I used FOB Lite in 2012 and 2013. This last year I have introduced variety into the events I organise (partly as a result of requests). That has been a failed experiment in my eyes as TO. I'm sure people will point to the recent Guardcon and say how wonderful Swedish was. That's great and I'm glad people enjoyed it. However it is worth noting that Auckland is a city of 1.5 million. The other change I made towards the end of 2013 was the introduction of the FOB Painting Checklist. To say this caused some people some angst is an understatement. However I stand behind the decision 100%. Well firstly because this is a hobby. It is visual. There is nothing better in a tournament than seeing two nicely painted armies battle it out over nice terrain. The previously permissive army presentation system had been introduced when the local community was growing and people were building their first army. Unfortunately there was no carrot or stick and as such progression stagnated. The checklist system was designed to give that incentive for people to work on that hobby aspect - it also incidently slowed people bringing the latest net list. I totally stand behind the system and the contention that anybody can achieve the maximum 35 points with a little effort. The system has potential 45 points so you can direct efforts where you feel your time is best spent. I would point to the efforts a number of people have put into their armies as a result of the system because they don't want to disadvantage themselves. I could also point to people who have made no effort. In the end my goal is to present attractive events. If I spend time (multiple weekends) to build nice terrain for events I don't think it is too much for people to spend a few nights working on their army if they want to maximise their points. So the FOB checklist is here for keeps. The final area I'd like to touch on is one or two day events. Now I appreciate that people have different priorities and calls on their time. For a lot of people one day events would be more attractive and convenient. I understand that. However from a TO point of view they take just as much time and effort to organise as a two day event. They also have most of the financial outlay that a two dayer has. As such they would need to attract significantly more people to make them "worthwhile". I don't see that happening to be honest. So that my warts and all precise of tournament turnout. If people do have ideas to increase turnout I am very keen to hear them. Yes, I'll likely be cynical - OMG You should run Panel Comp, it Roxxor - but I will at least listen. Okay, I'll take a swing at this. I've attended 3/4 FoB events this year including umpiring/playing in Ruination. In total I've attended 6 events this year and would have probably attended 3 or 4 more had I not been sent overseas for work. None of the above factors have affected my attendance or lack thereof. My decision to not attend Runefang was based on choosing to attend Natcon the week before as part of my fiancee visiting family and work issues, not the use of Swedish comp. I'll come to any tournament you throw tbh mate. I still am not sold on the FoB painting checklist, but I do understand what you're trying to achieve and I am coming around from where I was last year to your way of thinking (perhaps because I'm painting better?). A large part of this has been seeing the way the hobby is approached in the US as well. As for the issue of Panzerschrek as a competing tournament: I agree it puts more options out and splits players to a small degree. That said, I also strongly believe that the support for these more provincial tournaments and the turning of them into regular events will yield a net positive for the community. All that said I think many of your points are valid for many players in some combination of effects. I know I for one want to use my non broken toys as much as possible and prefer permissive systems. There are other factors though that I think are also at play, some of which you hit on in your earlier post on this subject. 1. The stagnant player pool - This is very hard for the community to remedy. The cost of entry is increasingly high, GW does not funnel new players towards events and from the outside looking in the Wellington Warlords does not appear to bring in new players at a rate that can replace the current attrition. 2. Garage Gamers stay in their Garage - I suspect that there are a large amount of garage players who simply don't engage with the tournament community. Now I don't know who these guys are until they reach out to us. What is clear though is that finding out about Fantasy events and tournaments in NZ is not even remotely difficult. Nearly any combination of "NZ Warhammer Fantasy Events or Tournaments" will turn up at a minimum this blog and usually the South Island Wargamer Forums, Auckland City Guard and Kiwihammer. You almost have to assume that anyone who wishes to know about and engage with the scene can do easily. So What? Garage gamers are choosing, for a variety of reasons that I can only speculate on, that we're not what they're after. 3. Familiarity breeds contempt: You've hit this one before and I think you're right to a degree. There are 3-4 people in the lower NI who make events happen and most of those still involve raiding your garage for terrain. Dude, you do heaps for the community and everyone knows it but that doesn't mean the responsibility sits you on alone. If you're not enjoying the stress that goes on with running some of these tournaments or just plain want a break then it's perfectly reasonable to take a break here or there. If people want events to be run they'll make it happen and attend, event running isn't a superpower just a matter of motivation. I think it'd be a shame to see you burn out over this. These are just my thoughts mate, and I totally hope they've come across as constructive as possible. FoB events are without a doubt the best it gets in NZ (a bar would be nice though) and you do a great job. For the most part you do all you can to promote them and make them appealing and frankly if there are people who don't appreciate that or take it for granted the loss is theirs. At the end of the day you've got to do what gets you your enjoyment out of the hobby and if that means leaving a space in the calendar for someone to step up and run an event themselves (or not if no one will) then that's all good in my books. Appreciate your comments Jeff...though I think my message may have got mangled. As I said on Monday I think it is great that Manawatu and Masterton are running events and I see that as both healthy and key to future growth. I also have no issue with what they want to use for comp etc. Variety has its own value. The point of the post was to generally lay out why I do things the way I do it and try to give some background data to explain how I've come to that point. I love the Warhammer hobby - love the game, models etc - and enjoy organising events. I'm lucky that a group of locals - including yourself - are happy to take a turn umpiring. Wellington is a (relatively) small city. Warhammer here is generally a garage game rather than played at clubs. Why is this? Well I know in my case, the club offers little over what I can get at home. I have better terrain, coffee and regular opponents. There is no unique selling point attracting me there. In the past (say 10 years ago) it was because it had a significant player pool and I could go and get a pickup game. But that is no longer evident. For whatever reason the chances of turning up at Warlords and getting a pickup game of WHFB are virtually nil. So I game at home. I do wonder about the local GW Hobby Centres. They don't seem to support the local community. Is it because they feel that the local community doesn't support them - I guess I mean financially. Surely though they have a vested interest in making the overall pie larger but it seems that is outside the current corporate ethos. They are a business, that's their choice. So there are disconnects to growing the tournament scene in that the pool seems stagnant. I love garage gaming. Same reasons as you. We have the best terrain I have ever played on, the coffee, snacks and company is good and it suits our schedules. Clubs don't give me any of that, and I think the community would do well to continue to move out of fixed halls and venues and work in the more loose knit fashion supported through blogs like this, Facebook groups and networking. Have you tried talking to GW About the mutual benefits of promoting the local scene? When I asked about where I could play, GW reluctantly helped. It seemed differing philosophies if not egos. Strange when it's mutually beneficial to support each other. Particularly before the overseas embargo, GW saw every customer that left the orbit of the store as a lost customer - with some justification. Their corporate pricing policy meant locals with a computer could access product at 60% local prices. And of course they did. The embargo means it is now 70-75% so still strong disincentive. I suspect local managers (quite rightly ) are focused on their sales rather than growing a bigger pie. They are between a rock and a hard place. GW managers also have long memories of 7th ed comp systems where they interpreted them to be "you cant bring your toys, so dont buy more" and may have been a little put off supporting events + allowing non GW minis means they dont want to be in a situation where they are supporting an event that will inadvertantly showcase non GW stuff. The sad reality is that FOB-lite is the most pro GW's vision of what warhammer "is" comp system I have come across. If someone had started playing WHFB inspired to create a Grom the Punch list...they can now take it to events. But I'm not sure how much traction GW stores would provide. Most of their instore sales are 40k related, their events focus on 40k/Apocolypse...maybe they are doing some End Times stuff...but the clientale who frenquent GW's are 40k focused...and people like me who COULD get stuff delivered, but occassionally get a case of "nowism", fold, and walk into GW to buy something. The best traction is getting your friends to play with your spare army, get them interested and up to speed...bring them to an event and BOOM! new nerd signed up! The hardest part is convincing them to play the first game and overcoming the cost barrier (hence the spare army technique). I disagree entirely Joel. As somebody who doesnt have any friends, I find it VERY difficult to attract new players to the hobby. To be fair Sam, you have in fact had one opponent quit the hobby this year. It wasnt me, it was the Tomb Kings. 2: players - I just enjoy the more laid back attitudes of 40k players. I allways dread going to a WHFB event because I don't want to be playing half the people I have to play against. For 40k I know there will usually be only 1 bad opponent. 3: I like to see armies that have been developed with a passion for the hobby, not just because they are the current net lists. This affects both 40K and WHFB, but the competitive aspects of tournaments encourage this in people who want to win. My mantra this year has been to just remember to play for fun, I don't ever go to events to win them, and I want to have half a dozen fun games with opponents I probably haven't played before. 4: variety in missions (or lack thereof) I love the different tactical challenges posed by missions. These level the playing field far more than any comp system ever can by forcing a spread of functionality in armies. A straight 6 of battle line is not for me.